Lock in a great price for Holiday Inn Helsinki - Expo – rated 8 by recent guests! The front desk staff was very friendly. The room was on the small side, but well-appointed and good value for money. The breakfast buffet was of international standard, with plenty of options. 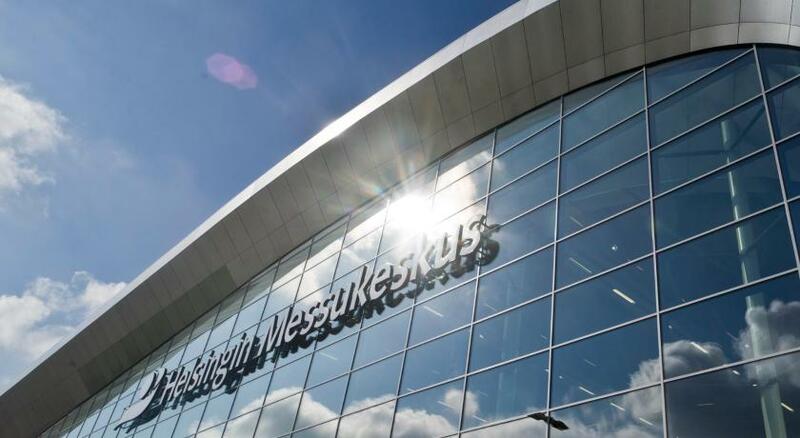 The location is great if you have business to the Messukeskus/Convention center, but a bit out of the way if you want to go to downtown Helsinki (15-20 minute tram ride, the stop is right outside the hotel). A clean, modern hotel next to the convention center. There was even an ice machine! Although it is not near the city center, there is a tram stop right outside the door. There is no AC and it was a bit warm while we were there so the room was warm at times but not too bad. The bar and buffet were nice but the service in the restaurant was often slow. Staff was super helpful and friendly. The room was just the right size and the shower was fantastic. A wide selection of tea and coffee. There's free internet access on a pc with a printer and a free wi-fi that actually works. There's also a roof terrace! The bar was opened till 4 am and there were blankets available to ward off the chilly night air. Overall I'd recommend it over some 5 star hotels I stayed in. Small, but good gym. Location is reasonable - about 50 min walking from the city center. Very quiet surroundings. Large room. Comfortable bed. The cleanliness, the courtesy of the staff, the shower!! Breakfast was good, suitably long hours. Room was very comfortable and very quiet. Great location - as was exhibiting at the expo, the hotel itself is located in the building, so you do not have to go out to enter the expo hall. Overall a great hotel with good people at Reception, comfy beds and spacious rooms. Nothing to complain about really. Holiday Inn Helsinki - Expo This rating is a reflection of how the property compares to the industry standard when it comes to price, facilities and services available. It's based on a self-evaluation by the property. Use this rating to help choose your stay! Holiday Inn Helsinki - Expo is connected to the Helsinki Exhibition Center in the Pasila business district. Free use of the sauna, fitness center and WiFi are included. All guest rooms at Holiday Inn Helsinki -Expo have a work desk and a tea/coffee maker. All rooms feature air conditioning. Executive rooms come with complimentary bathrobes and slippers. The Platta Restaurant serves both Finnish and international dishes, as well as a children’s menu. Children under 13 years eat for free when accompanied by a family member. Helsinki city center is a 10-minute drive from the hotel. Pasila Train Station is only 1,300 feet away. Pasila is a great choice for travelers interested in convenient public transportation, city trips and shopping. 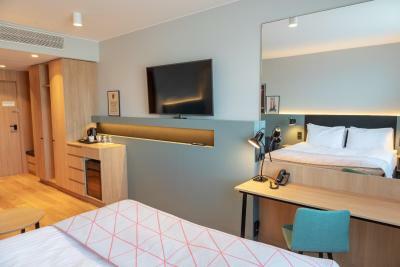 When would you like to stay at Holiday Inn Helsinki - Expo? Features satellite TV, as well as a minibar and tea/coffee-making facilities. Features satellite TV with free premium channels, a mini-bar and tea/coffee making facilities. Also includes free still and mineral water and chocolate. Features a sofa bed, as well as satellite TV, a minibar and tea/coffee-making facilities. 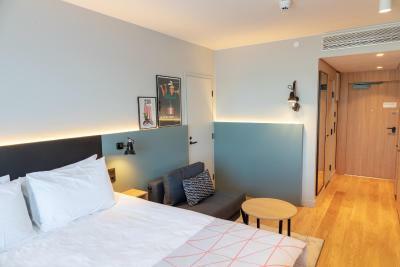 The hotel is interconnected with the Helsinki Exhibition and Convention Centre and offers guests unique and well-functioning services. 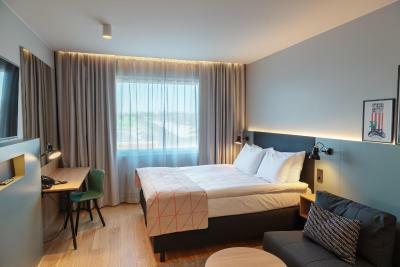 Flexible transportation links to Helsinki-Vantaa airport, the main railway station and the center of Helsinki make the Holiday Inn hotel a focal point for exhibition and conference guests. The exhibition and convention center adjacent to the hotel has a wide range of exhibition and conference facilities to offer our guests. 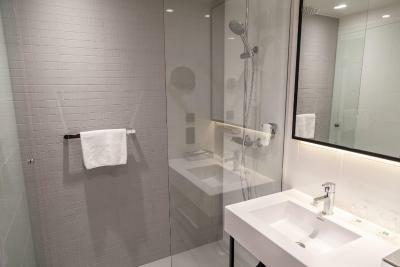 House Rules Holiday Inn Helsinki - Expo takes special requests – add in the next step! All children under 16 years are charged EUR 36 per night for extra beds. Any additional older children or adults are charged EUR 36 per night for extra beds. Holiday Inn Helsinki - Expo accepts these cards and reserves the right to temporarily hold an amount prior to arrival. Restaurant can be a bit slow when you order a-la-carte, especially for lunch as we had a bit of limited time due to being exhibitors at the expo. Keep this in mind - our burgers were quite slow and not good - missing the usual tomato, pickle and other burger 100% required things. Also the colesaw was not good and too bitter for my taste. Breakfast was very delicious. and the room was finnish style so the furniture arrangement was very convenient. very close to the station. The room is freshly decorated- some technical factory smell is present. Breakfast is limited and quite small selection. The beds were excellent, soft enough, great pillows and heavy blankets, really nice. The hotel is okay but nothing special. Good tram connection to the city center. Reception staff was very friendly. The room wasn't cleaned every day. One day I came and nothing was done with a room cleaning. It was disappointing. Very professional and helpful reception staff. Big room. Good food in the restaurant. Silent place, great for business travellers and others looking for good-night-sleep. Excellent breakfast. Early breakfast was enough for a half day.